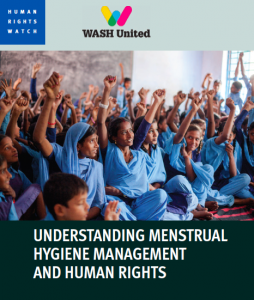 Human Rights Watch and WASH United released a guide for aid and development groups and others who work with women and girls, to address human rights in menstrual hygiene in their programming. “People who make policy and run programs – and even human rights advocates – often don’t fully understand the impact a woman’s monthly period may have on her ability to go about her life if she doesn’t have what she needs to manage it. By breaking the silence around menstruation, women can identify barriers they face in managing it.” said Amanda Klasing, senior women’s rights researcher at Human Rights Watch. For years, human rights organizations have documented how periods, and the poor policy and programmatic support for managing menstruation, have a negative impact on women’s and girls’ human rights. Decisions about the operation of refugee camps, detention centers, schools, and workplaces that affect the way periods are dealt with directly affect human rights. With too little support to handle their periods, women and girls have reported staying home from school, missing work, banishment by families, and humiliating treatment in their communities. People who work in development and aid organizations may see this bad treatment but lack effective tools to address it. The new practitioners guide will help them use a human rights framework to bring these problems to light, and resolve them. “It’s simple: women and girls have human rights, and they have periods. One should not defeat the other. Human rights are negatively impacted when women and girls cannot manage menstruation with dignity, but rights should also be at the heart of any solution.” said Hannah Neumeyer, head of human rights at WASH United, which works to end the global sanitation and hygiene crisis. “Practitioners are at the front lines of combatting period stigma and discrimination. This guide will help them tailor services and programs to help women and girls manage menstruation through realizing their rights.” Amanda Klasing, Human Rights Watch.